Ayutthaya Thailand – 8 Temples in Ayutthaya you should absolutely visit! 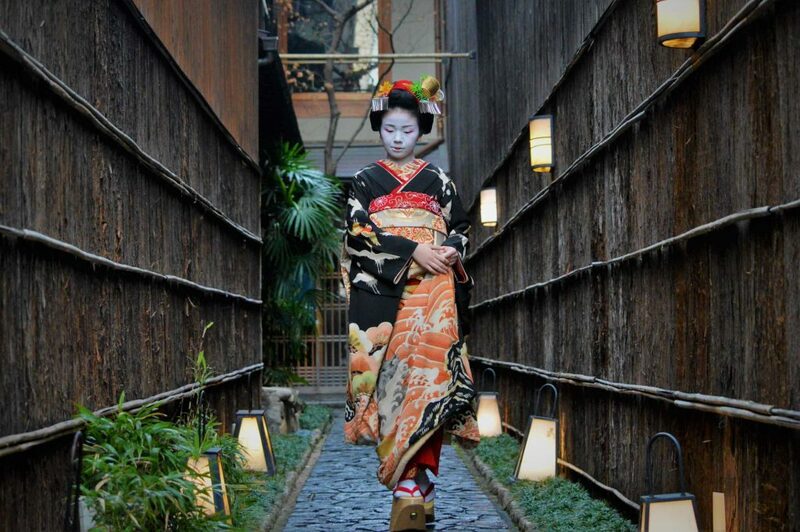 Gion Kyoto – As the super popular entertainment district that’s located in the heart of Kyoto, it represents the era of traditional geishas ruling the area. Although its roots could be dated back to the Sengoku period, it’s become such an iconic part of Japanese history and has helped developed the geisha or ‘geiko’ (geiko is the Kyoto dialect for geishas) culture so significantly that until this day, massive efforts are still being poured into this district to preserve it in its original form. When you visit today, you will find the area full of shops selling traditional Japanese crafts and wagashi, restaurants specializing in Kyoto’s esteemed kaiseki cuisine (and much more), and ochayas (traditional Japanese teahouses), where you might be able to witness geiko and maiko (geiko apprentices) entertain you through traditional forms of dance and service passed down through generations and generations. 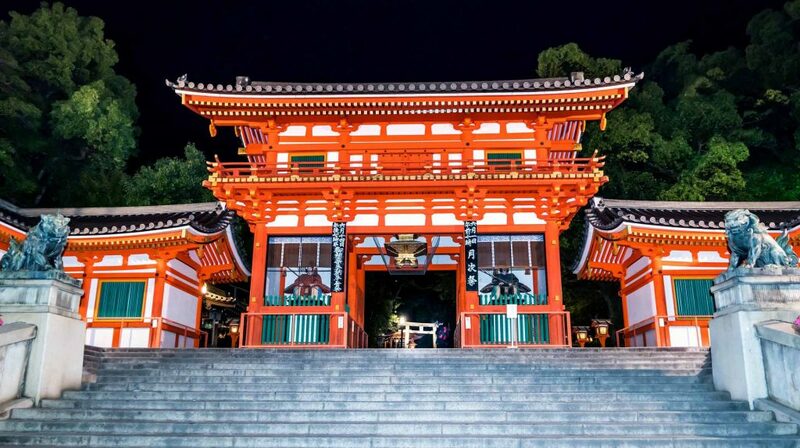 The location of Gion makes it easy to combine it with other well-known local hotspots such as the Yakasa Shrine, home to the famous summer Gion Matsuri, and Kiyomizudera, one of the most visited temples in all of Kyoto. Often people will plan their trip to include Gion and the nearby Higashiyama District in one day, and then visit all the attractions in between via a leisurely stroll. Easily one of the most famous and revered places in Kyoto, the image of Gion is what most people imagine when asked about how they imagined Kyoto would look. It stretches from the Kamogawa River to the Yakasa-jinja Shrine. 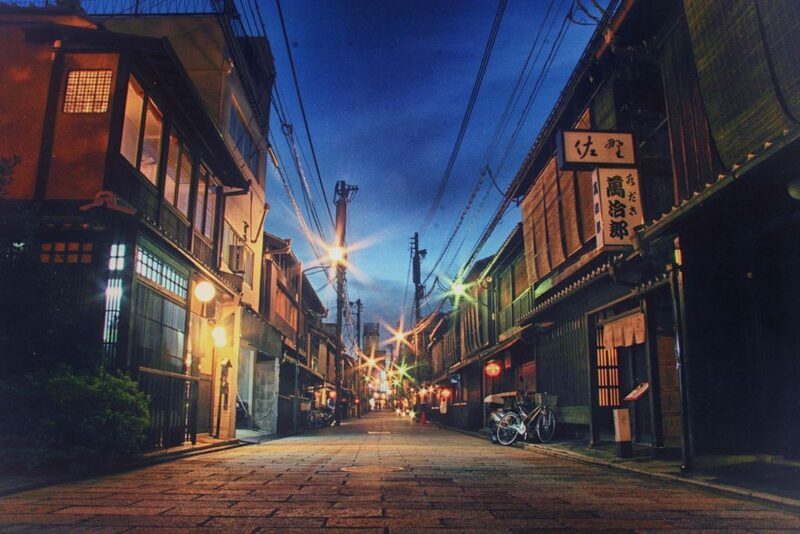 The existence of Gion Kyoto came about as early as the Edo period in Japan. It started when shrines and temples began populating the area, and due to the increasing number of visitors to see these said shrines and temples, ochayas also began to open exponentially to service them. Soon, the area made a name for itself, being a popular place to rest in between visiting nearby attractions. The idea of geishas stemmed right from its roots, when beautiful women were hired to work as entertainers and waiters to continue growing the entertainment services of the area. Over the years, and as different periods of Japanese history came and went, many changes were made to the region, altering its course, changing its structure, re-defining its beauty; however, the government realized soon enough that Gion Kyoto is such a significant region, and its original form has yielded such success and contributed to such a significant part of Kyoto’s history that they have implemented incredible lengths to preserve the city in its original form so that visitors can have a taste of what it was like back in the olden day – for a price. There’s no other shrine quite like the the Yasaka Shrine – some might even associate it as being the heart of Gion. 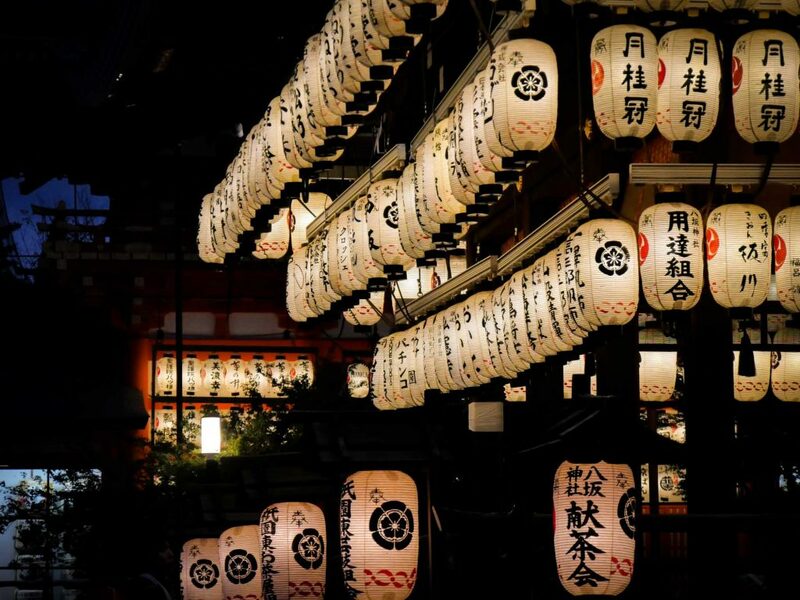 Established over 1000 years ago and originally called the Gion Shrine, it’s now a popular sightseeing spot in the middle of Kyoto, and it also plays host to the biggest summer festival in Kyoto, the Gion Matsuri (more on this below). The signature bright red wall features of the shrine are possibly the most recognized aspects of this grand structure, however, there are many interesting parts of the complex that allow you to walk around and explore to capture stunning images, such as the main hall of the shrine (which features both an inner sanctuary and an offering hall inside), and the hanging lanterns at its gates in the middle of the shrine. At night, the lanterns are lit up, and make for quite a beautiful leisurely stroll. For residents of Kyoto, this shrine is where they go on celebrate significant days, such as weddings, baby births, to pray ahead of major tests, and also just for general good luck and happiness. During New Years Eve, massive crowds can be found milling around this shrine to welcome the new year with good spirits. Access: From Kyoto Station, catch the 100 or 206 bus and alight at Gion Bus Stop. Alternatively, make you way to Gion-Shijo Station, and it is a 10-minute walk from there. 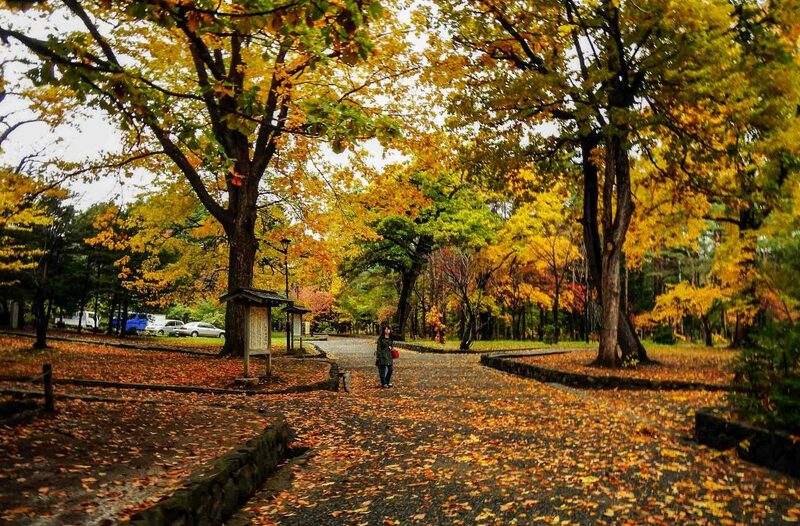 Like Yoyogi Park in Tokyo, Maruyama Park is located right in the middle of the city, and provides a slide of green paradise for those who want to rest their feet amongst nature whilst exploring this packed area of Kyoto. There are small water streams running through the park, and it is lined with a collection of the most gorgeous cherry blossoms trees in Gion. During the hanami season, you can expect almost every square inch of this park to be taken up by locals and foreigners alike, rubbing shoulders and possibly sharing food and drinks as they descend to prime spots close to the river and directly underneath the trees for the best picnic spots to spend entire days just taking in the beauty and getting drunk and being merry with all their families and friends. During autumn, the park is filled with oranges, reds, and yellows as leaves continually fall from their trees to create a picture-perfect image. During the rest of the year, you can simply take a stroll through the park, purchase some food nearby and have a picnic lunch, or feed the ducks in the duck pond in the middle. At all times of the year, you’ll likely come across locals doing the same. Access: From Kyoto Station, hop on the Bus no. 100 or 206, and alight at the Gion bus stop. Walk past Yasaka Shrine, and you should be at the entrance of the park. 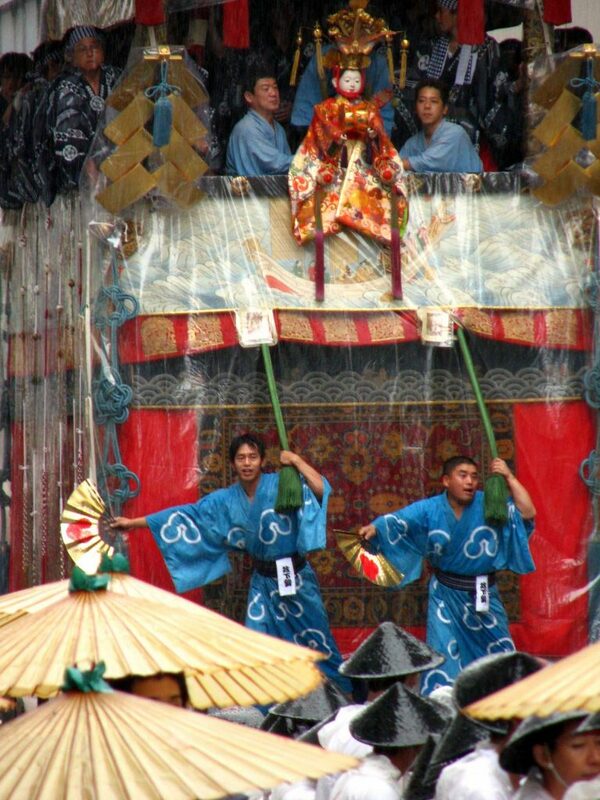 One of the biggest summer festivals in Japan, and certainly in the top ranks as one of the biggest ones in all of Kyoto, the Gion Matsuri is a festival that goes over the course of an entire month. Yep, you heard that right! 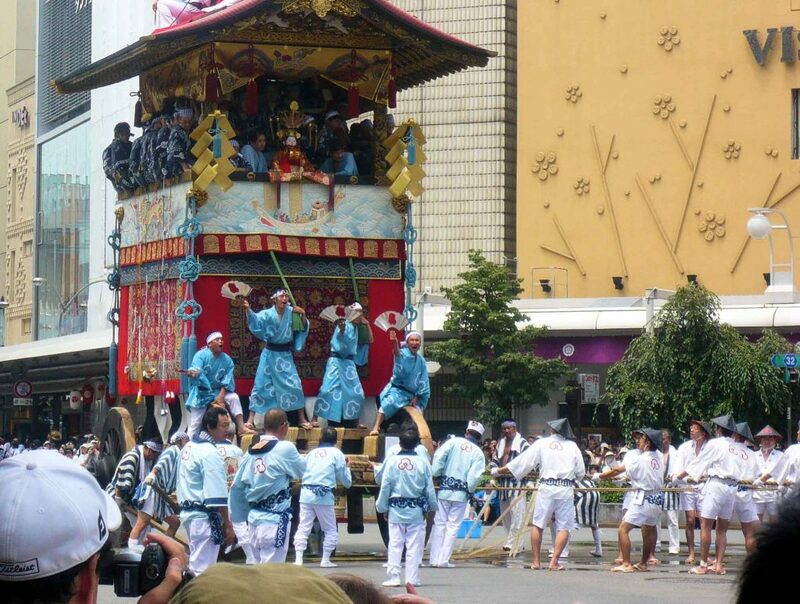 Different events happen at different times during the month, but the climax of the matsuri could be the ‘Yamaboko Junk’ (the ultimate grand procession of floats) which usually happens on July 17th. There is also a second, smaller procession of floats which happen on the 24th. The festival can be dated back to more than 800 years ago, when it was thought up as a way to reach out to the gods during an outbreak of that year – and it still continues to go strong even today. Two different types of floats (33 in total) are created specifically for this event which are ginormous in size and exquisitely decorated, all of which are pulled along on massive wheels by people. The main days of the festival happens during the three days before the ‘Yamaboko Junk’, where streets are closed from 6:00pm until 11:00pm and the entire area becomes inundated with food and drink stalls and crowds descend upon them to enjoy a lively dinner as well as check out all the floats on display before their parade. Access: The route of the parade extends from Shijo-dori, through Kawaramachi-dori, to Oike-dori. Routes will be closed off from vehicles during certain days, so make sure you visit the website for updates, and adjust your transport time according. However, the busiest stations during this time should be Karasuma and Shijo Station. A visit to Kyoto’s Gion district is synonymous with visiting the famous Buddhist ‘Pure Water’ Temple. People visit this temple for good luck prayers and wishes, but it also plays a role as providing one of the best views of the cherry blossom and maple leaves during their respective season from its stunning wooden stage. During such seasons, there are also major evening illuminations that draw in massive crowds for their unique beauty. 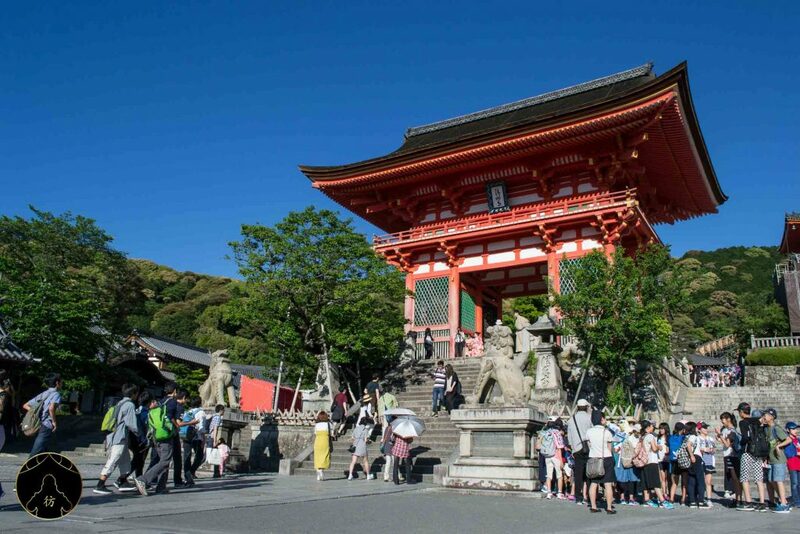 From Kiyomizudera, you can also visit Jishu Shrine, located near its main hall, which is a shrine dedicated to the god of love. Legend says that if you stand at one of the stones at the entrance, and are able to make your way with your eyes closed to the opposite stone which sits maybe 20m away, you will receive good luck in finding love. 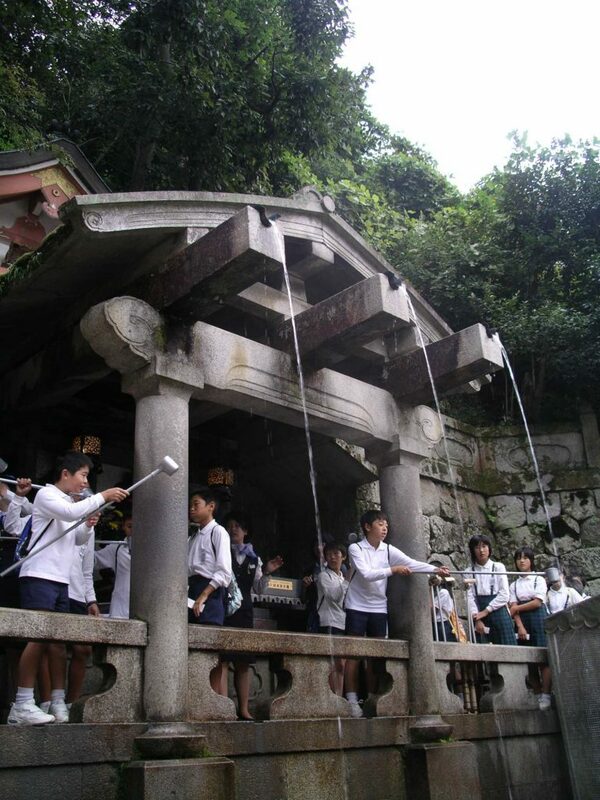 Otawa Waterfall, the waterfall in which Kiyomizudera was named after, is located near the base of the main hall. The water runs into three separate streams, and you will be able to drink from them to gain either longevity, success in studies, or a greater love life – however, drinking from all three is frowned upon and considered greedy. Access: From Kiyomizu-Gojo Station, it is a 20-minute walk. Otherwise, if you are coming from Kyoto station, hop on bus 100 or 206, and alight at Gojo-zaka or Kiyomizu-michi bus stop, and it is a 10-minute walk uphill to the station. This street, fully of understated shops and tea house, will yield the highest chance of you being able to spot geishas. In the evenings especially, it is on this street that you might be able to catch perfectly donned up true geishas elegantly heading to their next appointment. However, if you are on the lookout for geishas, please note that the only way to do so (other than organizing and paying for a true geisha entertainment experience) is from a respectful distance. It is greatly frowned upon to make physical contact with a geisha just for photo purposes, and often they have a place to be, so asking them to stop for photos is a great hindrance (as you can imagine how many other visitors will request the same thing once they’ve seen you do it!). Pontocho-dori is slowly becoming one of Kyoto’s premier dining vicinities. 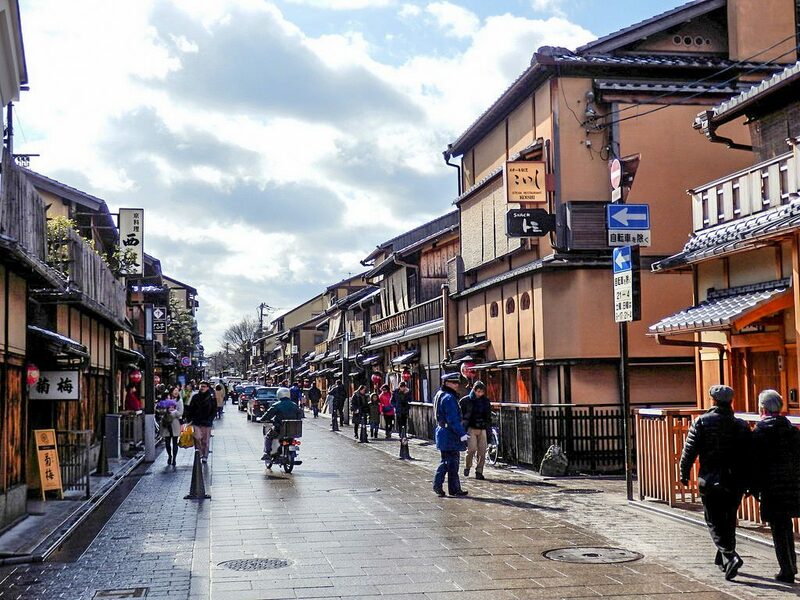 It’s a typical narrow street with bustling restaurants lining either sides, offering anything from street-style yakitori to exclusive high-end Kyoto cuisine. It is here in summer that visitors can dine ‘kawayuka’, Japan’s version of alfresco. The restaurants on the east side of the strip build temporary platforms over the flowing river and allow patrons to dine out in the open air. Today, Pontocho-dori is one of the areas where Geishas are still consistently getting work, and you might be able to spot them during the evenings heading to the various establishments. People have been known to spot them alighting from taxis and and heading mainly for the ochayas. As you can see, there are many places to visit around Gion so it’s a pretty convenient area to stay at during your Kyoto trip. For more information, you can read this blog post: Where to stay in Kyoto. 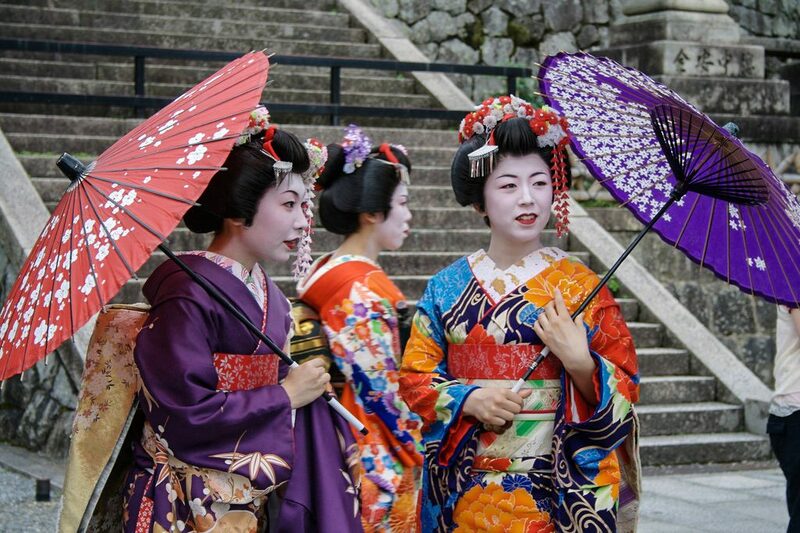 Maiko, not to be confused with geisha, are young women who are training to become officially recognized as geishas – to be a geisha is quite a status to hold. 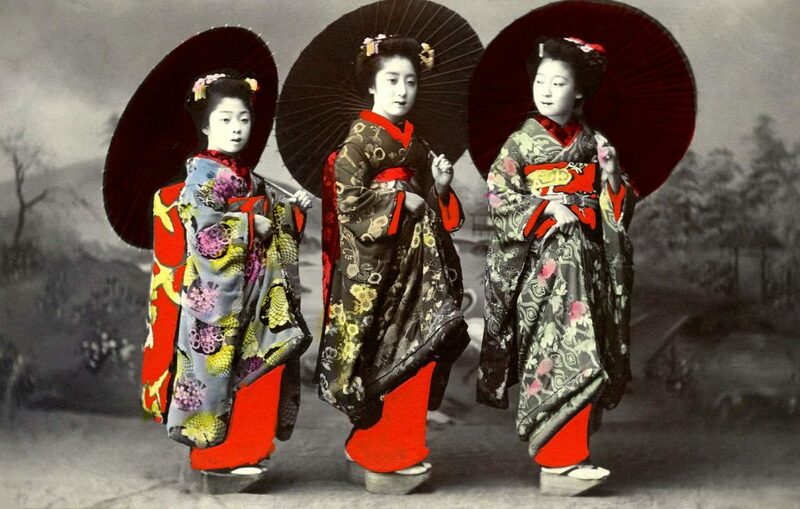 The beauty of maiko’s are known across the world, as many characteristics of their full body appearance is very unique to Japanese culture. The Japanese government has recognized that there has always been immense interest and fascination with the maiko look, and thus services are offered all across Kyoto which allow you to dress up in full gear and make-up to look like a maiko for a few hours, to wander the gorgeous ancient streets of Kyoto and take photos as though you’ve literally travelled back in time. 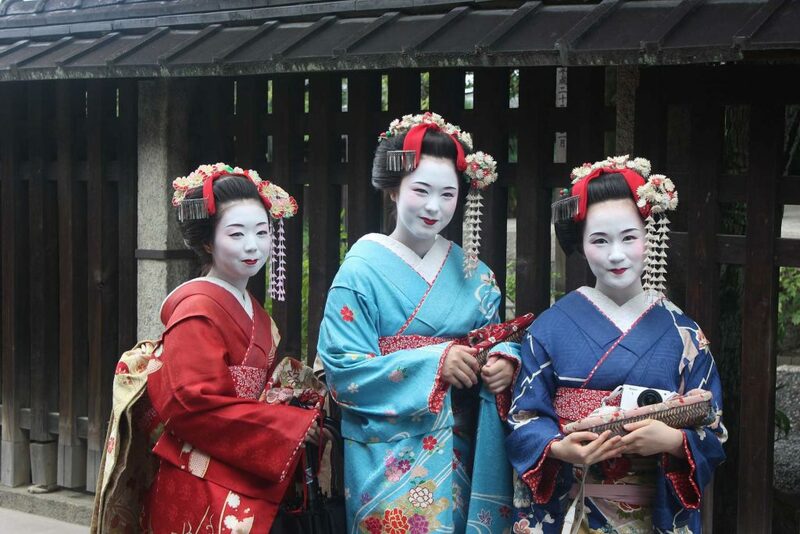 It’s one of the most popular activities for females in Kyoto, and whilst there are many businesses these days which offer the services, GoVoyagin have struck up a fantastic deal with one of the most professional operators allowing all visitors booking through their website to take advantage of 15% off their maiko makeover! Considering as how this an activity with a price on the higher-end, this is quite a bit of savings. If you’re interested, click here for more details. 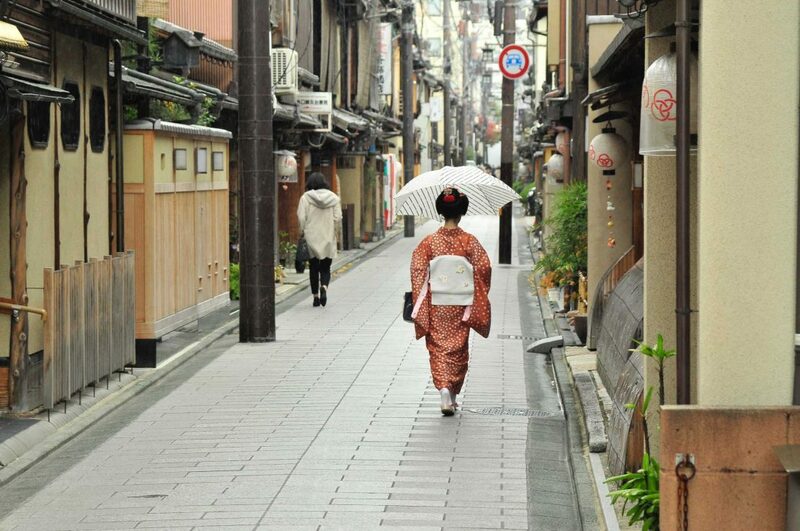 The mysterious yet gorgeous allure of Gion calls to anyone and everyone visiting Japan. Kyoto is almost certainly on everyone’s to-do list when visiting Japan for the first time, and Gion is one of those district that you must visit for its superb history and culture alone before you can even consider ticking Kyoto off the list (for the time being). Schedule in a day or two to really give it a thorough run through – our advice is to visit during the blooming of the cherry blossoms or the falling of the autumn leaves.